Meet my new foster ~ Cindy Lou Who. When I heard her name I was a bit befuddled, but my son reminded me that she was the little girl in The Grinch Who Stole Christmas. There are angels on earth and the other day I met one named Vanny. She is pug mom to Julio and lives in Queens, NY, but was visiting family in the Cleveland area for Christmas. She was perusing Craigslist when she came upon a pug for sale for only $20. 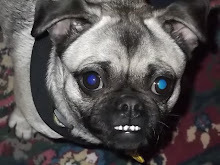 An unspayed pug. She was so worried about who might buy this girl and for what purpose, she went and got her knowing she could not take her home because of a one dog rule in her apartment. She took her to the vet, bought her a crate, toys, jammies, food, etc. She contacted Ohio Pug Rescue to save this girl, and now she is here with me. Chompers (what kind of name is that for a girl?) 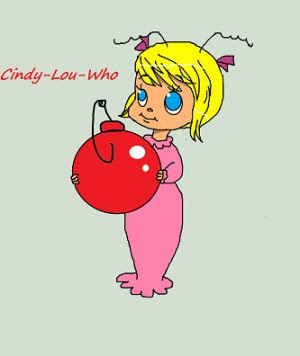 is now Cindy Lou Who. I'm guessing the theme for the month was characters in Christmas stories. She is on an antibiotic for a UTI and she is having some real issues, hence the doggie diaper. This is a first for me. I'm hoping the meds kick in soon and it is nothing more serious. This poor baby has obviously had MANY litters of puppies in her life. The vet put her age at 5, but she looks much older. She is the sweetest thing and has made herself quite at home. Oh, and she is not quite a pug. The vet says she's a puggle which was my first thought when I saw a picture of her. She is now safe and that is the most important thing. I can't believe I got a picture of my 3 favorite boys all smiling :) Jake is now officially taller than his "little" Uncle Bill. (My brother is "big" Uncle Bill.) It looks like he soon will be as tall as his dad J. He definitely looks like him. Bill is on his way back home and will arrive in Las Vegas soon. It is always so hard to say goodbye. Both my boys have turned in to fine young men. What more could a mom ask for? I hope everyone has a safe and Happy New Year. Thank you for taking time out of your busy lives to read my ramblings. I hope your Christmas is every thing you hoped for ~ and more. The big day is almost here. It arrives so quickly ~ and seems to be over in an eyeblink. Tomorrow will be a busy day preparing the food that can be made a day ahead and then in late afternoon heading to the airport to pick up my son. His being here will make Christmas extra special. I purchased this cigar box for the graphics in the lid many years ago. Isn't it just too sweet? My patriotic tree is one of my favorites. I switched out a 4' green tree for a 6' tinsel tree this year and I just love it. It sits on a landing that is just 3 1/2' x just under 4' ~ proof that a tree can fit just about anywhere. My salt glaze Santa collection grew considerably this year. Friend Melissa gifted me with a half dozen of the little guys. I also found an Eldreth Santa at a local antique mall. I was so happy to find him at super price. I only have 2 others made by this potter. Well, can you believe the one I bought was one I already had? Go figure. I decided to do a little antiquing today and this little vintage papier mache Santa came home with me. Antique pox ~ a disease for which there is no cure. Bobbie, the Evening Stitcher has inspired me to pick up my needle and do a little cross stitch. A sweet little pattern by Pineberry Lane. 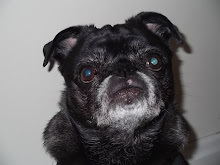 Tomorrow I'm off with Ernestine to wrap gifts for a few hours to benefit Ohio Pug Rescue. I still have a few things to pick up at the grocery store and of course a little Swiffering and dusting. Christmas Eve day my son will fly in. Life is good. Santa's Lamb is a punch needle pattern by Donna Munson (My Country Keepers on etsy). 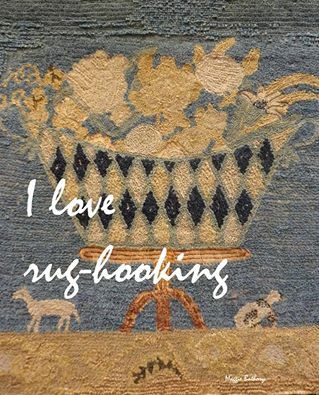 I gifted the rug to dear friend Dolly (who had adopted my foster Eema years ago), so I can now share it with you. 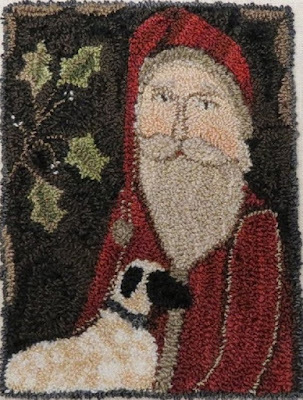 With permission, I changed it to Santa's Pug. I'm not sure why, but that little pug face gave me fits and I reworked it 4 times. I'm still not thrilled with it, but I cried uncle. 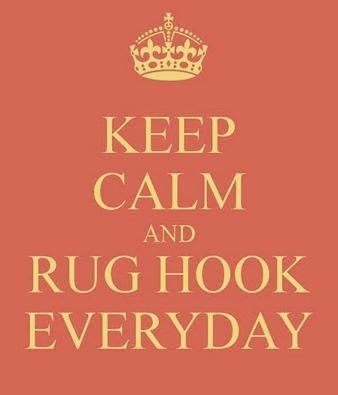 I also was unsure how to hook the face and could not find wools to my liking in my stash. Isn't that always the case? 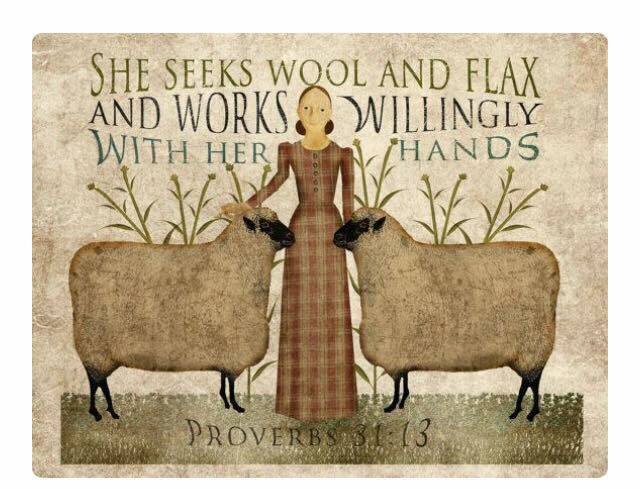 No matter how much wool one has . . .
My last major pre-Christmas task is done. I am NOT a baker, but I do bake pumpkin rolls. Since my older son will be home for Christmas, pumpkin rolls are a must. So funny because my younger son will not eat anything pumpkin. Five rolls are now in the freezer. A couple for eating and the rest for him to take home. Friday is Winter Solstice and the days will begin to get longer. I will gladly take a few more minutes of daylight each day. Hard to believe it is almost Christmas. I know, I say that about everything, but the days, weeks, months and years are flying by at record speed. I am just thankful I am able to enjoy each and every day that I have. I have much to be thankful for. Every year I post about TubaChristmas and what fun it is. This year was no exception. I think it is the 45th year overall and the 23rd year in Lorain. This year there were 78 tuba players ranging in age from 10 to 75. Ohio had the second most TubaChristmases in the US, with 20 of them. Sometime the acorn doesn't fall too far from the tree. When my son J was a young teen, he loved quirky apparel. For quite some time he wore a Cat in the Hat hat. Jake and I were at the store yesterday when he found a bow tie that he had to have. I was so surprised to see him wearing it to TubaChristmas. Too funny. The green matches his new braces. Somehow it doesn't quite go with his Pikachu shirt . . . lol. I have several feather trees around the house. My upstairs landing sports a feather tree (on right). The little tree to the left is not made of feathers. A small one in the dining room with many vintage glass ornaments. And yet another on the opposite side of the dining room. Vintage celluloid reindeer and a Santa stand guard. A little pickle is hiding in the tree. You can read about the legend of the pickle here. This is my only vintage feather tree, purchased 25+ years ago. Many new but also some vintage glass ornaments and vintage glass bead garlands. And a pickle hiding here, too. 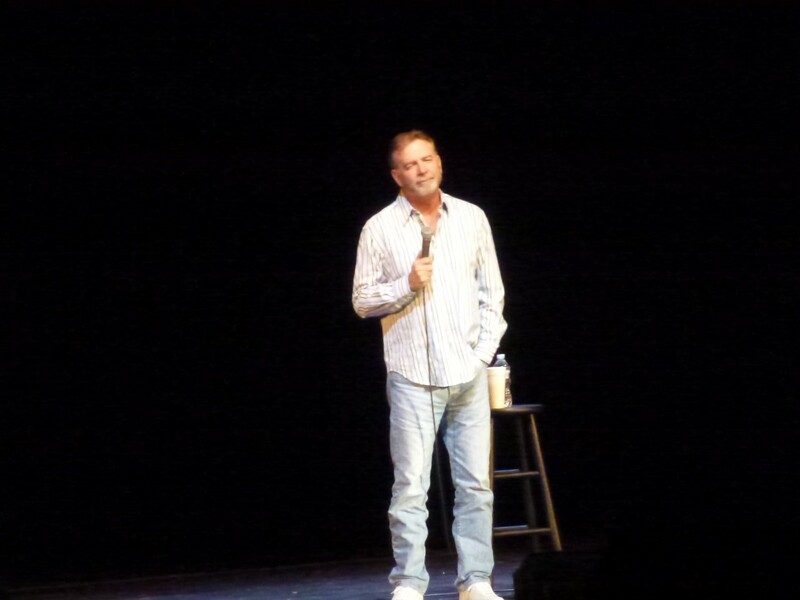 Saturday evening we went to hear comedian Bill Engvall in our city at the gorgeous Palace Civic Center. We had seen him a number of years ago and found him absolutely hilarious. If you've not heard of him, you can find him on You Tube. 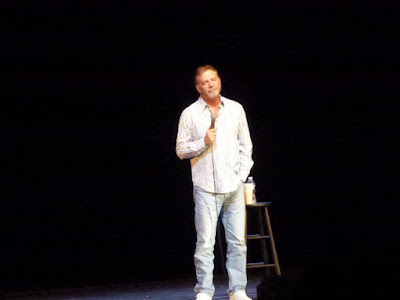 Perhaps you've heard of the Blue Collar Comedy tours? He is one of the comedians. He is so funny and it is refreshing to listen to him. The worse word he said was jackass and there were only a couple off color jokes. If you ever have the chance to see him, I highly recommend it. Today I am sharing my Santa tree with you. Sorry the pictures are so washed out. There are a few vintage ornaments. Clam shell Santa gifted to me and painted by blog friend Julia in South Carolina and a pine cone Santa from dear friend Wink many years ago. A fun Santa angel tree topper. A very special Santa on a swing painted by my mom several decades ago. This was one of her favorites! Cinnamon stick Santa painted by yours truly over 20 years ago. I painted many in different colors. I've finally pulled a few loops ~ VERY few ~ on my last Christmas gift that I can't share until gifted. I had better get busy. Christmas day is fast approaching. I thought I would not pressure myself this year, but unfortunately this was a last minute decision. Well, not quite last minute since a couple weeks ago I decided to hook this, but I had not found any time to pull loops until last evening. So why am I on this darn machine . . . lol?